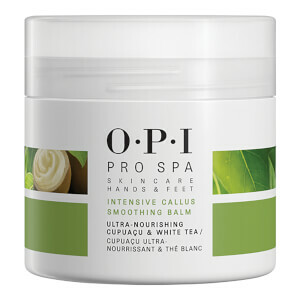 Treat dry, rough feet to the OPI Prospa Exfoliating Sugar Scrub; a luxurious formula that allows you to experience a professional, spa-like pedicure from home. Fortified with dual-action Sugar crystals, the foot scrub expertly buffs away hard patches to reveal enviably soft, smooth skin from heel to toe. Detoxifying White Tea Extract combines with nourishing Cupuaçu Butter to moisturise and hydrate, leaving tired soles feeling restored and comforted. Apply a generous amount to dampened feet and legs and massage in with a circular motion for 2-3 minutes. Rinse thoroughly to remove and towel dry feet. Canola, Sucrose, Silica, PEG-12 Dimethicone, Parfum/Fragrance, Limonene, Phenoxyethanol, Linalool, BHT, Saccharum Of cinarum, Citronellol, Geraniol, Persea Gratissima (Avocado) Oil, Aqua/Water/Eau, Theobroma Grandi orum Seed Butter, Ethylhexyl Palmitate, Butylene Glycol, Camellia Sinensis Leaf Extract, Chamomilla Recutita (Matricaria) Flower Extract, Citrus Aurantium Dulcis (Orange) Fruit Extract, Citrus Limon (Lemon) Fruit Extract, Pyrus Malus (Apple) Fruit Extract, Lecithin, Tocopheryl Acetate, Retinyl Palmitate, Caprylic/Capric Triglyceride, Synthetic Wax, Alcohol, Glyceryl Stearate, Oleic Acid, Ascorbyl Palmitate, Isopropyl Titanium Triisostearate, CI 42090 (Blue 1).